Tastes Like Fear, out on 7 April, is the third novel in Sarah Hilary's DI Marnie Rome series. I reviewed the previous two, Someone Else's Skin and No Other Darkness, here and here. Like its predecessors, Tastes Like Fear is a dark, London-set police procedural in which Marnie Rome and her team are pitted against a deeply disturbed, sinister antagonist (this isn't a spoiler; we see Rome's quarry in action right from the start, although we're obviously unaware of their identity or motive). The story begins with a car accident caused by a half-dressed teenage girl staggering out into the road - and apparently wandering off immediately afterwards. Could she be May Beswick, a 16-year-old recently missing from her apparently stable home? Or could she be one of any number of other errant teens who drift to the capital when there's nowhere else to go? Either way, we soon learn that someone, known only as Harm, is offering street kids somewhere 'safe' to stay - but at what price? Tastes Like Fear is perhaps the grittiest of the three Marnie Rome novels in terms of setting - this is a perfectly portrayed world of decaying tower blocks, hostels and underpasses where rough sleepers congregate, a world populated by homeless ex-soldiers, troubled teenagers and feral children. And yet somehow, the quiet, ordered environment provided by Harm is infinitely more terrifying - Hilary is adept at evoking the tense, claustrophobic atmosphere of a closed world that constantly teeters on the knife-edge of one person's terrifyingly fragile sanity. There isn't a great deal of overt violence in this novel, and yet the horror is absolutely genuine. As before, Marnie is still tortured by the presence of Stephen Keele, the foster brother who murdered her parents some years previously, and continues, from his young offenders' institute, to take a keen interest in her career. Although we learnt a little about Stephen's background in the previous book, I do think more will have to be revealed about him soon: although he and his unsettling obsession with Marnie remain fascinating, I don't think Stephen can remain a mystery forever if this element of the books is to continue to hold my interest. It does feel as if there's less of Marnie herself in this instalment in the series, although this isn't a criticism at all. She's still a strong and perceptive presence and, aided by her team, is the driving force for the ultimate resolution of the plot; plus, a lot of her back-story is now already known to us and doesn't need to be heavily reiterated. There really is very little to find fault with in Tastes Like Fear; if you enjoy horror-tinged crime novels full of surprising twists, in which killers' motives are primarily psychological, the Marnie Rome novels are probably something you'd enjoy, and like Sarah Hilary's previous books, this one is a masterclass in pace and plot. 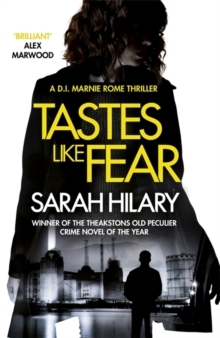 Thank you to Sarah Hilary's publisher for providing me with a copy of Tastes Like Fear to review via NetGalley.